an accelerated way to make more money from your network! Throughout the years of establishing our affiliate network, we’ve come to a simple conclusion; there will always be product owners, new niches, and markets to tap into. There will always be affiliates, publishers and Internet marketers, monetizing their communities, looking for the next hot product to promote! In 2017 we surpassed 3.6 billion people online. In 2025 the prediction is rumored to hit 7-8 billion people. Your personal network is only getting bigger, but monetizing new business is NOT getting easier. With the social world, we live in; we are better connected than ever before. We now have “friends” on Facebook/ LinkedIn we’ve never talked to but somehow got connected to via a post, promotion, group, or an ad we clicked on. The potential in your current network is much bigger than you can imagine. At this very moment you likely have a heap of product owners, and internet marketers in your network that you hadn’t even considered or thought about. There are many people you already know and have good relationships with, BUT have yet to find a sustainable way to make money with them. The Preferred Partner Program is developed for those who have an established professional network of affiliates or publishers, advertisers and product owners of any niche and size. Do you have a network of affiliates and publishers already established in the affiliate marketing industry? Do you know of any advertisers or product owners interested in the affiliate marketing channel as one of their revenue streams? If that sounds like you, continue reading to learn how you can make more money by referring affiliates and identifying new exciting products to our global network! Whenever you refer someone to a product resulting in a sign up or purchase, you’re paid a commission for the referral. Affiliate networks and advertisers offer a referral fee for any affiliate you send their way. These can range from 1% – 10%. We’re offering a totally new way for you to track exactly how every single one of your referrals perform in our network and increase your profit even more! Everything you need in one place. 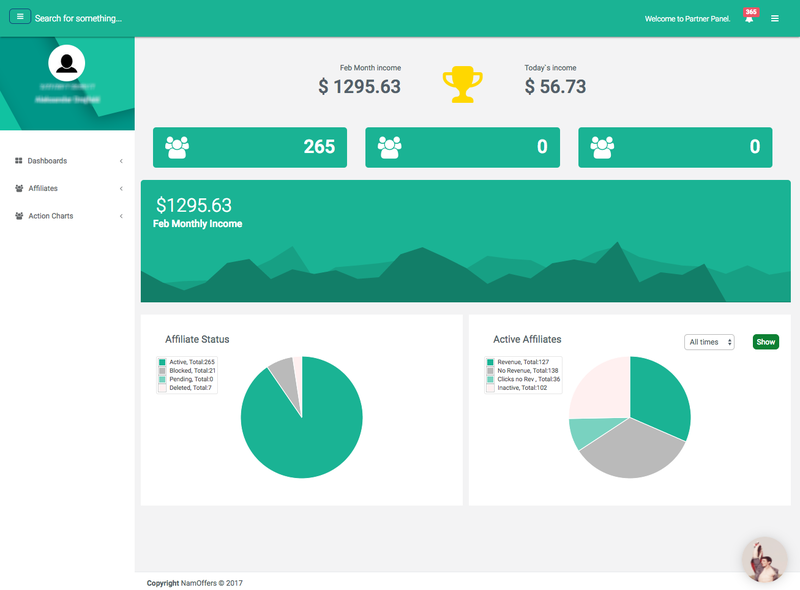 Your fully customizable dashboard. Easily keep track of your referrals and their status, monitor traffic, track conversions and more! Now you’ll never be left in the dark when it comes to who your referrals are and how they are performing. We believe in transparency and control; therefore, we created this simple new dashboard that allows you to see your profit real-time, and where those profits are coming from. 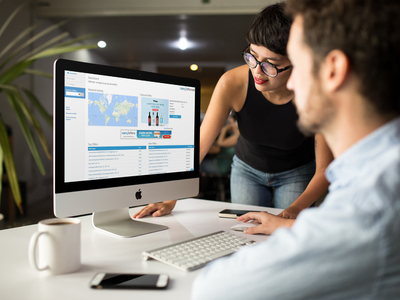 Our custom dashboard gives you the ability to build your panel as needed. Monetize your referrals with graphs, watch the mountain of your monthly income compared to last month, or see who made you the most money. 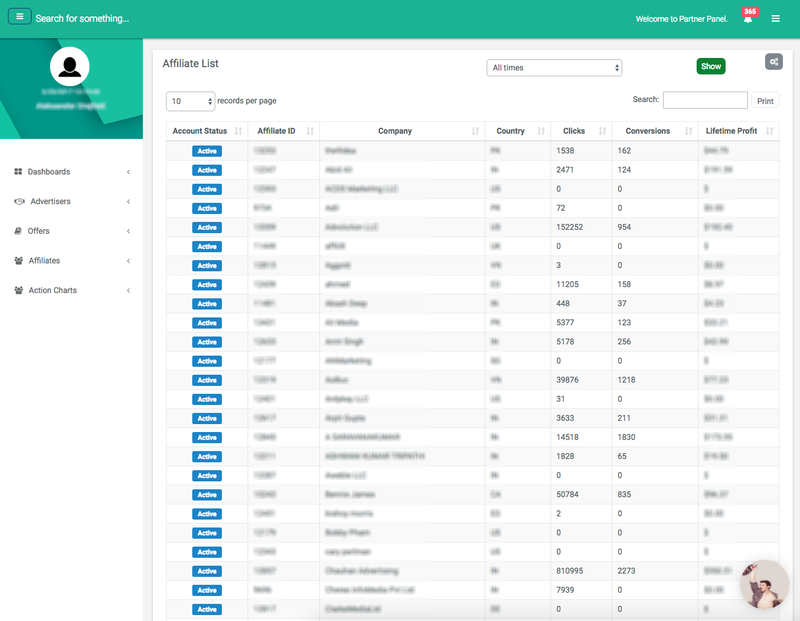 Complete lists of advertisers/affiliates you referred, offers and activity. Custom tables allow you to turn on/off and only show the data tables that are suited for your needs. See account status, name, country, clicks, conversions and most importantly, profit earned. 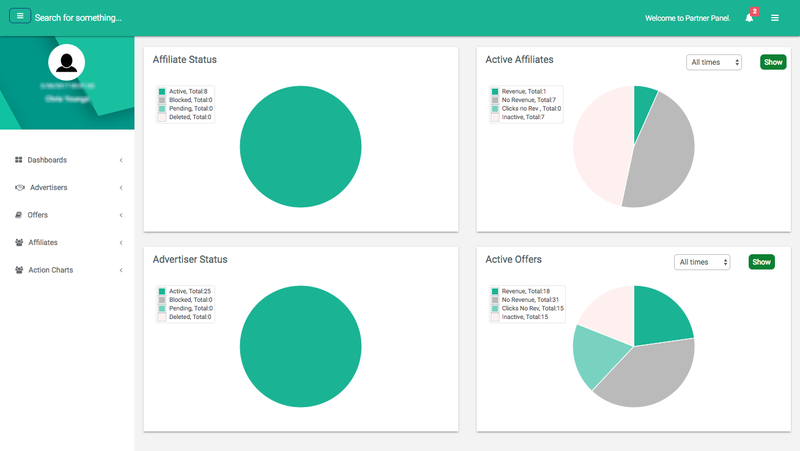 See the status of your affiliates or advertisers using our action charts. You have the ability to see who has an active account, still pending, generating you revenue or just clicks. Using our charts give you quick insight into the quality of your referrals. It get’s better! We understand how to maximize YOUR referrals ROI. We not only have our professional sales team who takes good care of each referral in a structured and very strategic way, we also offer weekly, and bi-weekly calls that have one purpose… to inform you of what’s going on and how you can profit even more from your referrals without doing any extra work. Our commission structure is tier based and goes from 5% Net Profit and up over 10% depending on the referrals you send, the quality of traffic, and the revenue generated. You will NEVER have to do any cold calling, prospecting, or follow-ups. 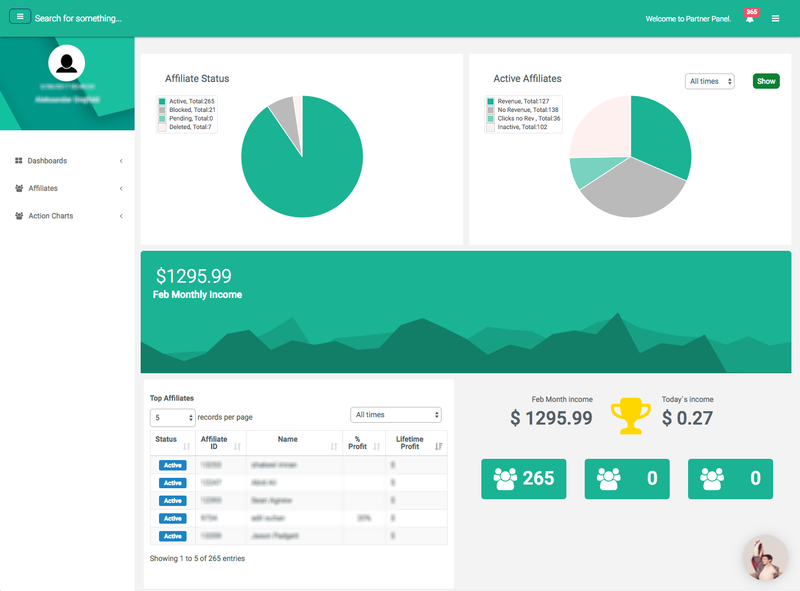 Get your referral link today, add it to your site, to your signature, post it in your group, ping your super affiliates friends and add them to your list and start seeing earnings within your first week. Having access to marketers you know well is your best option to start profiting from our referral program. If you already have an established network of affiliates or publishers this will put you in the fast lane for earnings. People with experience in affiliate marketing that understand the art of promoting various products using traffic sources like Facebook, Google, Bing and Native ads. Accessing your core network will create exponential revenue growth. For example, say you have a small circle of ten affiliates, publishers each profiting $10,000/monthly. If accepted into our referral program you will be offered a lifetime monthly residual of 10%* of what is earned per referral. Anyone with their own websites or access to sites teaching/sharing info related to affiliate marketing. If you have a large email list of internet marketers or access to any, this is for you. If you are a part of a current mastermind group or in any social groups of like-minded marketers, this is for you. If you are a coach and teaching the art of affiliate marketing this is for you. Our Affiliate referral concept is for anyone with established knowledge within the performance marketing arena, or affiliate marketing space. If you already understand the process of setting up campaigns, optimizing, and generating ROI this is for you. The sharper the skill set, the quicker to profit! No selling or long drawn out follow-ups. It’s DOESN’T get any easier than this! If you don’t know what the heck we are talking about, this program is definitely not for you. However, if you do know and have the experience and a vast network of marketers, it’s time to monetize and profit immediately! If you already have an existing account with nam/offers, reach out to your dedicated affiliate manager and ask how you can enroll into our preferred referral program. If you do not have an existing account, click on the ‘Enroll Now’ to get started. Make sure you fill out the entire form as instructed. Welcome onboard! Imagine having the ability to receive 5% commission from each and every transaction your network has ever generated! Imagine for each Paypal transaction, you’re receiving 3% of that transaction! What would that be like? In fact, it has never been any easier to create a product line-up until recently. It used to cost a fortune that only giants like Wal-Mart and GNC could afford. These new products are hitting the online stores like never before. As individuals, we now have the same privileges these giants had: the ability to create any thinkable product, and within hours reach millions of consumers at a very little cost. Because of this new reality, consumers are bombarded with new products daily; everything from premium to low-quality products. One important point to be aware of is that only 10% survive, and only a few end up being profitable. At nam/offers, we mastered the art of connecting the right product with the right marketer. We call it “The True Offer Match”: An accelerated way to get a product promoted correctly and by the right marketers. Marketers who specialize in any niche will always get the best possible match, yielding the best possible outcome for both the affiliate and the publisher, as well as the advertiser and product owner. The idea of constantly looking out for the next trusted and tested product is no easy task for any marketer. It’s a big challenge, but now nam/offers is changing that game! By joining our referral concept #2, you gain access to our talented group of marketers who are hungry for new niches to promote! The best of the best, who deliver new customers, and care for the product they promote! To serve our global demand, we are opening our portfolio of the best marketers on the planet, all managed by our specialized affiliate managers and experienced sales team. Anyone with access to premium products can utilize our referral concept #2, and reap the immediate benefits that follow. * If you are a product owner and need more exposure please reach out to our live support for a great opportunity. In this case, it’s your network that counts. The more you know, the more you reap without having to do any additional work, and the faster you can deliver on our request the sooner you see the cash flow. First, you have to be accepted into our program, next you get direct access to our system. From there you will be connected with our team and immediately be informed what is currently trending and making money through our global network of marketers. Next up you connect our requests with your network. If you have offers that are a fit, you will get access to our professional sales team which will assist and close the deal. Our team will do the work, set everything up. Your involvement is to connect, and that’s it. Sit back, let our system do its magic, and start seeing the sales roll in. It’s that easy! Isn’t it time to take advantage of all those years you’ve connected with the right people? Start reaping from every transaction your network generates by using our simplified system, today! 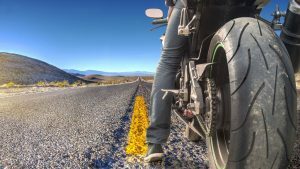 The fastest way to start profiting from our referral program is if you already have established a network of advertisers and/or product owners. If you already know who in your network works within affiliate marketing, those are your best options. The lifetime of an offer can last for years. If you find the right match, it can have a significant impact. Some do 100 transactions a day; others do 1,000 and up over 10,000. If you like the idea of lifetime monthly residual, you’ve come to the right place. If you like to reap the benefits long term. Our program is designed to work for you and NOT the other way around. We give you the requests, you match the offer, and we do the rest. If you want to be a part of something bigger, a team, and a global community this is it. If you have access to premium and tested products, you better get your application in! Watch your profits increase day by day! If you don’t know what the heck we are talking about, this program is definitely not for you. However, if you do know and have the experience and a vast network of advertisers and/or product owners, this is the perfect way for you to start monetizing and profiting immediately! Consider this your VIP invitation to monetize your network of advertisers and product owners in a brand new and easy way. Imagine having the ability to receive 5% commission from each and every transaction your network has ever generated! Imagine for each Paypal transaction, you’re receiving 3% of that transaction! What would that be like? In the affiliate marketing industry, timing is everything. In order to keep up with the demand we’re seeking preferred partners to help us connect the dots, quickly.